Ajahn Brahm gives a talk on the practice, challenges and benefits of seclusion, such as retreats. Ajahn explains why people find it so hard to stay by themselves and why he never feels lonely. Ajahn reflects upon how monks and nuns are not escaping life, we are. He points out that living as a hermit, monk or nun forces you to learn about yourself and to develop a relationship with yourself, because you can’t escape yourself. Whereas always needing people, television, radio and busyness is a form of escapism. Ajahn Brahmali talks about understanding the allure and danger of sensual pleasures and alternatively cultivating the deeper sense of pleasure to be found in the spiritual path. 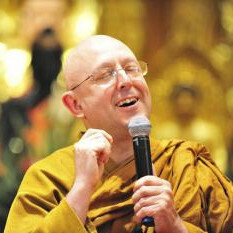 Ajahn Brahm teaches that being in the present moment brings peace and contentment. We apologise the recording is missing the very start of the meditation. Ajahn Brahm talks about the core Buddhist values of virtue/ goodness, peace and compassion/ kindness and how these form the basis for skilful interaction with others and are the guiding principles to everything he does in life. 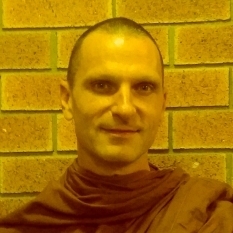 Ajahn Brahm gives a talk on the first line of the Dhammapada: “the mind is the forerunner of all things”. Ajahn reveals what and how powerful the mind is. As well as how Buddhism has a deep understanding of meditation and the nature of the mind, such as how it works and how it can be used to do amazing things. Ajahn Brahm gives a talk on the benefits of disappointments, frustration and not getting things our way, because it teaches us to let things go more and to flow with things. He offers suggestions for dealing with our problems, such as forgiveness and seeing that what's really important in life are the people and our spiritual development. Ajahn Brahm goes on to talk about the problems of power and trying to control our environment. Ajahn Vayama ponders what it is Buddhist practitioners are trying to accomplish in terms of the mind? Ajahn Vayama reveals what we are practising and why. And shares advice on how to be mindful of our body and mind. Venerable explained Buddha’s Eight Worldly Winds by giving real world examples such as our need for praise and to blame. Venerable then led us through a body sweep meditation to truly relax us. Venerable then gave a talk on how to avoid suffering and the "Buddha’s Eight Worldly Winds". 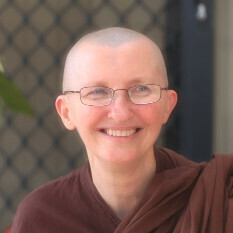 Ajahn Brahm gives an overview on what it’s like to be a monk or nun. Ajahn talks about the monastic rules, such as why they need rules, their purpose and what happens when they keep or break them. He points out the importance of understanding the purpose of the rules, so that one keeps them for the right reasons and he explains how they are conducive to happiness, wellbeing and prosperity. Venerable Hasapanna talks about how to inspire your meditation by finding appreciation in yourself. Responding to a recent question on whether it is possible for women to become enlightened? 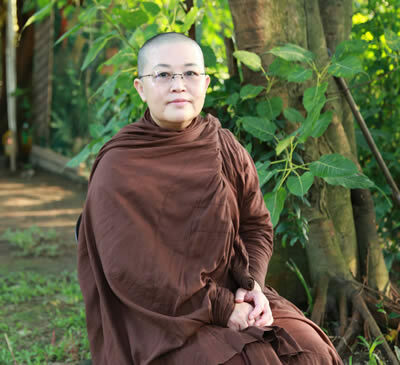 Ajahn Vayama gives a talk on the history of the nun’s order and shares stories of the fully enlightened nun’s in the past and women who have left their families and sometimes royal privileges to enter the monastic life. Hence demonstrating that women have the same capacity and potential for spiritual growth as males. Venerable Hasapanna offers a teaching on feelings, especially how to deal with unpleasant feelings. Venerable offers practical advice on how to reduce and remove the unwholesome mind states such as greed, anger and aversion. 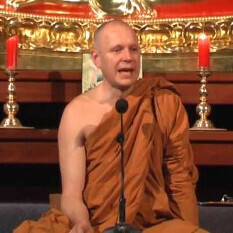 Responding to questions about what is the Buddhist perspective on life and the world, Ajahn Brahm gives a deep explanation on the Buddhist idea of Emptiness and how it relates to meditation. Ajahn Brahm says he will ‘reveal the whole meaning of life.’ He starts by explaining the science and nature of our world and parallels between what we know of the world and the world of our minds. Venerable explains meditation for beginners then leads us through a 30min meditation. Venerable then talked on mental health issues by relating his own personal struggle. Ajahn Brahm reflects upon how monk’s experiences can relate to laypeople's experiences in a busy world. He explains how monks can experience the same stresses and difficulties we experience in the world, but they have a layer of understanding, wisdom and peace to deal with the problems of life much better. Ajahn Brahm also points out that doing good work for others arouses a lot of energy, which enables one to perform at a high standard even when very busy. Ajahn Brahm talks about Clairvoyance and Buddhism. He asked the audience "did you predict I would speak on this tonight?" He discusses why some predictions are right and others not right. As well as why monks don't show their clairvoyance powers. Ajahn Brahm tackles what it means to be a great thinker or smart thinker. He challenges the primacy of the importance of thinking, and advocates instead wisdom based upon inner silence and direct knowledge. Ajahn Vayama gives an enlightening talk about how the limitations on our perceptions can cause us to have misleading and inaccurate views about how the world works, including how our own minds work. Only when we develop a mindful attitude and ability to step back and look at the conditions upon the mind can we begin to untangle the puzzle of life.